I’ve learned that the secret to a great seafood bisque is using seafood stock as the base. Now if you’re like me, you don’t usually have homemade seafood stock just sitting around waiting to be used in a dish. 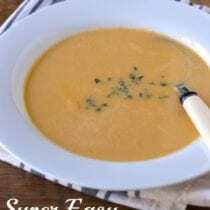 So I think you’ll love how this Shrimp Bisque recipe incorporates making a super quick stock with your shrimp shells (and supplementing it with a little beef stock) so you can get that delicious, bold flavor without having to work too hard. Enjoy! In a large pot, combine the water, beef stock, and bay leaf over high heat. Peel and devein the shrimp, and once the water mixture is boiling, throw in the shells only (set the shrimp aside). Lightly boil the shells for 15 minutes. Strain the shrimp broth through a fine sieve into a glass bowl or measuring cup. This will be the base of your soup. Discard the shells. Wipe out the pot and melt the butter over medium heat. Add the onion, celery, and garlic and cook while stirring occasionally for 2 to 3 minutes (until it softens but does not brown). Add the raw shrimp and tomato paste to the pot and cook until they are pink and firm, another 3 or 4 minutes. Return the shell broth/stock to the pot along with the salt and cayenne pepper and bring to a boil. Lower to a simmer and cook for 10 minutes. Puree the soup using a handheld (or counter top) blender, stir in the cream, and serve warm. Top with fresh thyme if desired. You are so right about the seafood stock being a stumbling block for seafood stews and soups. I’m glad to see you came up with this quicker and (less intimidating) way to make this soup. I didn’t grow up eating seafood, and I still don’t have good instincts when it comes to cooking it. Great idea for simplifying the process for making soup! 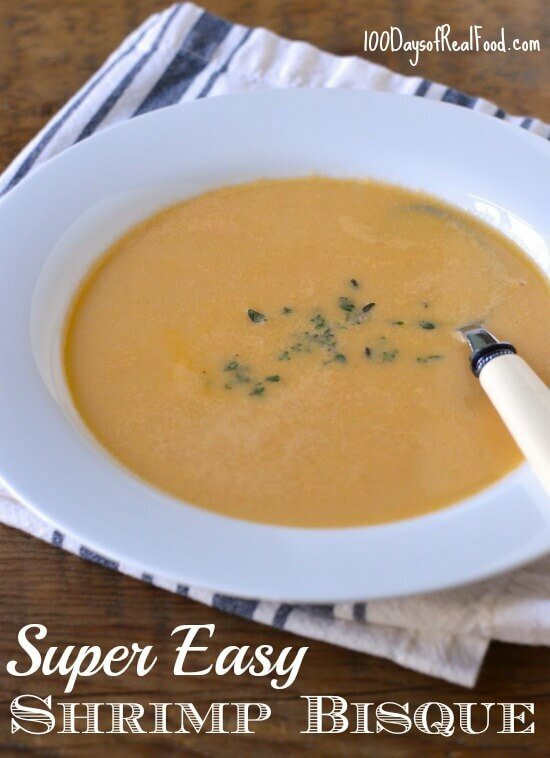 Can’t wait to try this amazing soup recipe! This sounds like something even a busy graduate student could do! :) Thanks so much. I’ve never heard of shrimp bisque, but I’m sure if it’s anything like lobster bisque, it’s delicious! I can’t believe you can make it in just 5 steps- I’ll definitely have to give it a try. Thanks for the recipe, Lisa! Any suggestions on turning this recipe into lobster bisque? What could you use in place of the tomato paste? We are tomato free in our home. Hi. You could leave the paste out. Looks good. Do you think chicken broth could be substituted for beef? Hi Martha. You probably can but the flavor would not be as bold. This looks and sounds so delicious, Lisa! “Bisque” sounds like a fancy soup so I love how quick and easy this is. I will be making it, for sure! any chance you have the nutrition information on this? Hi Shannon. No, sorry. We do not provide nutrition details. This post will explain that philosophy: https://www.100daysofrealfood.com/2013/01/04/healthy-eating-defined/. Used to make this soup in my Restaraunt. Very very popular. I would peel my raw( hopefully whole shell on) shrimp and use the shells to make an awesome stock. The raw shrimp was rough chopped then barely sautéed in butter and added last minute to the hot soup. Amazing touch extra work but well worth the flavor. I really like the flavor of brandy or sherry in bisques. Do you think it could be added to your recipe? My daughter, 13, and I just made this bisque last night. Really yummy! I did not have cayenne on hand so I split the pinch between paprika and a california chili powder I have (similar to cayenne). I also didn’t have heavy cream and used heavy whipping cream. I did add an ounce of brandy. It was great for a first try with the substitutes…the only thing we’d like is for it to be a bit thicker, creamier. Next time we will use the heavy cream and a bit less water to see if that helps. Could I sub coconut milk (from that can) for the heavy cream? Hi there. We’ve not tried but I do think it would work. Coconut milk does alter the taste somewhat. This post help explain why we do not provide nutrition information: https://www.100daysofrealfood.com/how-to-find-and-avoid-trans-fat/. I added 2 leeks and used a full cup of cream and left the cayenne pepper out. Was very yummy!